Spatial modeling with ArcGIS focused on the distinction of discrete prehistoric activity areas. ArcGIS 3D Analyst displays of the activity areas enable an understanding of overlapping occupations. GIS improves archaeological understanding in ways not readily available through classical statistical software analyses. Electric power provider Tri-State Generation and Transmission Association, Inc., is owned by 44 electric cooperatives and serves 200,000 square miles of Colorado, Nebraska, New Mexico, and Wyoming. When Tri-State planned to upgrade the 92-mile, 115-kilovolt Nucla-to-Sunshine Transmission Line in San Miguel and Montrose Counties, Colorado, because of the potential to disturb archaeological deposits associated with numerous prehistoric and historic sites on public land, the United States Department of the Interior Bureau of Land Management (BLM)—Uncompahgre Field Office requested the involvement of archaeologists to mitigate the impacts of construction. Alpine Archaeological Consultants, Inc., was hired to conduct archaeological investigations and monitor construction activities during the transmission line rebuild. Western Colorado has been occupied for at least the last 10,000 years, and numerous sites represent the overlap of many temporally different occupations. Traditional archaeological mitigation in western Colorado has attempted to focus on single occupations by excavating prehistoric and historic structures or fire pits, which generally allows the identification of plant and animal processing events, as well as the definition of stone tool workshop or activity areas. One prehistoric site along the Nucla-to-Sunshine Transmission Line, site 5MN8324, was inappropriate for such excavations because of a lack of suitable subsurface deposits. At that site, archaeological investigations focused on the mapping of surface artifacts in an effort to define intrasite activity area clusters and any association those clusters may have had with temporally discrete prehistoric occupations. Fieldwork at the 2.45-hectare (6-acre) site began with Alpine carefully flagging individual artifacts for detailed site mapping. The dense pinyon-juniper woodland prevented the line-of-sight requirements of using a total station for site mapping, so an electronic map was created with a survey-grade Trimble 2008 GeoXH device attached to a vertical rod with a circular bubble level. Utilizing multiple base stations, 97 percent of the map data was corrected within a +15 cm margin of error. In this way, 1,550 artifacts were point plotted and described. Artifacts in the mapping protocol include 1,454 pieces of flaked stone debris, 92 flaked stone tools, 3 fragments of ground stone tools, and 1 stone tool cut-marked bone fragment. ArcGIS 10 Desktop with the Spatial Analyst extension was then used to define discrete activity areas, which were graphically displayed with the ArcGIS 3D Analyst extension. Discrete groups of artifacts were created with ArcGIS Spatial Analyst by building nearest-neighbor isopleth gradients. The gradients were based primarily on the geologic source of the stone and secondarily by each artifact's proximity to similar materials. The artifacts were sorted into different geologic groups (e.g., Jurassic-age stone versus Cretaceous-age stone) based on visual descriptions of the stone material for each artifact. Within each geologic group, finer distinctions allowed for further subdivision into distinct geologic nodules (e.g., tan Cretaceous-age stone versus white Cretaceous-age stone). All the stone artifacts were grouped into one of 11 geologic nodule types. 3D modeling allows archaeologists to visualize the degree of overlap between discrete stone tool material activity areas. Once each artifact was assigned to a geologic nodule type, ArcGIS was used to create a nearest-neighbor isopleth based on a 50 m2 (i.e., 4 m radius) activity area. Or rather, the number of neighboring artifacts of the same material within 4 m of a single artifact was used to create an amplitude value for that artifact. The amplitude points for all 1,550 artifacts were then turned into a raster with six contour intervals (using the Jenks optimization method). The contour intervals were then displayed as an isopleth map. 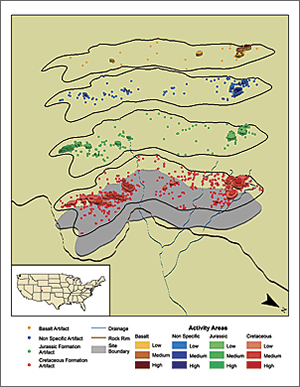 The higher amplitude clusters are likely representative of activity areas with high archaeologically interpretable value. In essence, by defining groups of artifacts that likely came from the same geologic source, archaeologists can better define and understand prehistoric stone tool use in western Colorado. 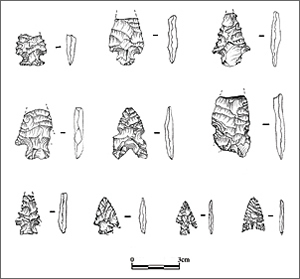 Understanding prehistoric use of an area is easier if the spatial clusters are shown to be temporally discrete, which archaeologists frequently accomplish with temporally defined projectile point forms. During the mapping protocol, temporally diagnostic arrow points and atlatl/dart points were found. Those projectile points indicate that the site was occupied between 2000–1200 BC and AD 450–1400. Spatial analyses of the density groups with reference to the projectile points indicate that in only one case were projectile points from two different temporal periods included in the same artifact group. In that case, however, there were subtle spatial differences within the group to separate the two. 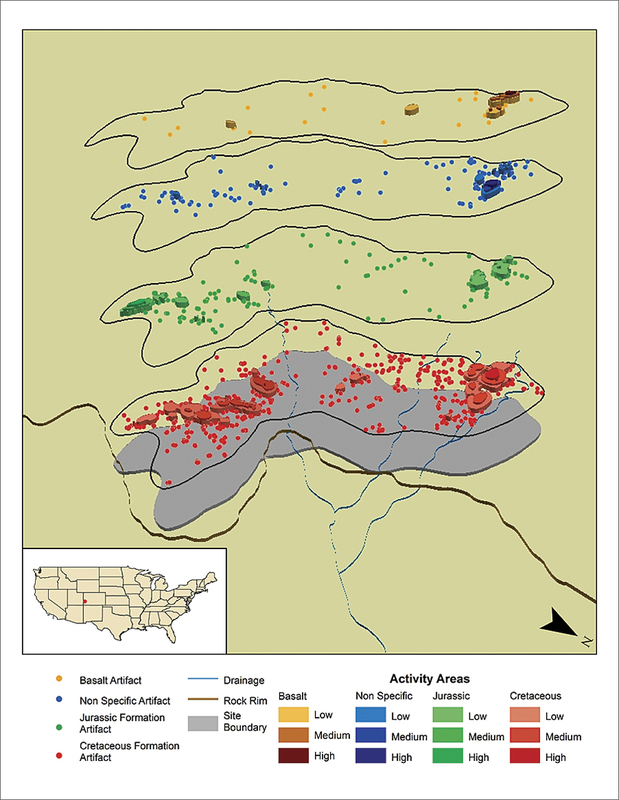 As such, the cluster analysis performed with ArcGIS Spatial Analyst enabled the spatial and temporal division of artifacts into discrete prehistoric activity areas. With Spatial Analyst, the hierarchical clustering of artifact groups allows the analyst to focus on areas of likely activity and spend less time dealing with distant or fringe pieces within the analytical dataset. By removing the lowest contour values, which are mostly background noise from thousands of years of occupation, spatial analysis allows archaeologists to concentrate on artifact groups that are more readily interpretable as the product of focused human activity. Both authors are employed by Alpine Archaeological Consultants, Inc., in Montrose, Colorado, where Matthew J. Landt is a principal investigator and Seth Frame is a GIS specialist. For more information, contact Matthew J. Landt (tel. : 970-249-6761, extension 23) or Seth Frame.